Thanks to a long time subscriber for sending the inspirational message entitled The Magic Bank Account. Read it below or listen to it here in a very sincere presentation from people @ work who obviously understood the message. 1. Everything that you don't spend each day will be taken away from you. 5. The bank can end the game without warning; @ any time it can say "Game Over." It can close the account & you will not receive a new one. You would buy anything & everything you wanted right? Not only for yourself, but for all the people you love & care for. Even for people you don't know, because you couldn't possibly spend it all on yourself, right? 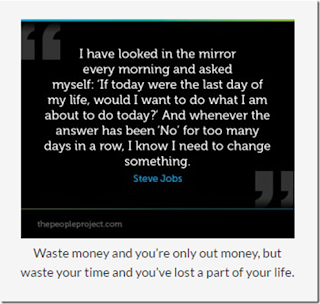 You would try to spend every penny, & use it all, because you knew money would be replenished in the morning, right? Actually, This game is real. Shocked? Yes! Each of us is already a winner of a much more valuable prize. We just don't realize it. 2. And when we go to sleep @ night, any remaining time is not credited to us. 5. Each morning the account is refilled, but the bank can dissolve your account @ any time without warning. Those seconds are worth much much more than the same amount of dollars. Think about it & remember to enjoy every second of your life, because time races by so much quicker than you think. So take care of your self, be happy, love deeply & enjoy life. Here's wishing you a wonderful & beautiful day. Spend your valuable prize wisely. No violation of man's rights, short of murdering him, exceeds that of the imposition of an income tax system in which the government lays claim on an individual's property – to take whatever portion of what one produces in order to give it to others to dispose of. This concept precisely fits the definition of a slave – a person who is strongly influenced & controlled by something, in this case the income tax code, which people are forced to obey, & one person's legal property becomes the property of another. This is the type of greed – legalized theft by the government – that Dr. Sowell referred to above. Carol told me it is such a waste to have people protest Trump's income tax returns when there are so many other things of importance & injustice around the world that this energy could go into. We have to remember that Trump's election made Democrats realize they are fish on a hook fighting for their political lives & saving their progressive statist Democrat hides, @ the expense of everyone else, is the only cause they are willing to fight for. Now in the case of Donald Trump's income taxes – Trump's detractors asserted that he pays little or no income tax & because Trump would not release his income tax returns during the presidential campaign they became certain of it. How surprised everyone was, when two pages of Trump's 2005 income tax return was illegally leaked that showed Trump paid $38 million in income taxes on $153 million of income (after deductions including a $103 million write off of business losses). Click here to see Trump's 2005 income tax return. The above income tax return shows that Trump paid over $31 million in 2005 because of the alternative minimum tax (AMT) – see line 45 of the return. 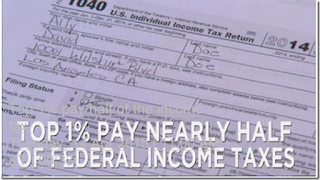 The AMT is a supplemental income tax imposed by the federal government that is required in addition to the baseline income tax (see line 44 of the return) for many individuals with complicated returns regarding exemptions or special circumstances – not necessarily seven or eight figure incomes. The AMT requires a taxpayer to calculate their income tax liability twice, once under regular income tax rules & rates & a second time under AMT rules & rates. The idea of the AMT is to allow far less deductions & a higher effective tax rate. Since the AMT is part of the standard 1040 Instruction Book economist Steve Moore was correct over two decades ago when he said the AMT is not an alternative minimum tax but a mandatory maximum tax. Who among the protesters earns $38 million per year let alone pays that amount in taxes – the answer George Soros. Who among the protesters becomes a multi-billionaire & then patriotically gives up the free enterprise system to run for president to bring wealth creation to all the citizenry – the answer none of them. That is what Trump did. Trump stipulated during the campaign that he employed tax accountants & attorneys to minimize his tax burden – a universal goal whether people use high power tax accountants & attorneys or do their taxes themselves. Of course all of Trump's employees paid income taxes from their wages after working on this unproductive exercise of filing income tax returns. What a waste of brain power & talent having these educated people fill out 1040 forms every year. In addition, Trump donated his first quarter salary of $78,333 (annual salary prorated from January 20 to March 31) to the National Park Service. See copy of check below. For his donating trouble Trump received criticism from the usual bunch of enemies of America: CNBC said the donation was not nearly enough; the Sierra Club called the donation a publicity stunt; & a 2017 MBA candidate tweeted that the donation was tax deductible & that all Trump was doing was taking money from one part of government, moving it to another, & getting a tax deduction – this cheap misuse of economic principles totally ignores that the money was Trump's property originally, having earned it working virtually 24/7, & that an income tax deduction amounts to cents on a dollar. This Ivy Leaguer is counting on people being easily fooled. To put Trump's income taxes in perspective the non-partisan Tax Policy Center projected that the top-earning 1% of Americans paid 45.7% of the individual income taxes in 2014 while earning just 17% of the income – or 2.7 times taxes paid to income received; the bottom 80% of income earning Americans paid 15% of all federal income taxes in 2014 while the bottom 60% paid less than 2% of federal income taxes. 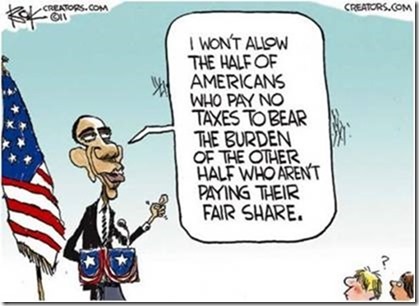 These type of statistics are the basis of nonsensical statements made by politicians like BO in the cartoon below – & even more pathetically Democrat followers who believe it. Trump is catching on to the Democrats' time wasting tricks, is seeing them more & more as distractions, & has pretty much gotten matters like his personal income tax foolishness out of the way so that he can concentrate on turning the country around from the dangerous cliff BO was driving it to. The American economy has been stuck in BO's deliberate harmful policies, that were documented on this blog for eight years, that resulted in a new normal of 2% annual growth from mid 2009 to the present – this compares with an average annual growth rate of GDP of over 4.5% from 1983 to 1988 & just under 4.0% growth from 1993 to 2000 – periods when most everyone prospered or @ least had a chance to succeed. Trump has promised economic growth of over 3.0% for the next decade & even that scaled back forecast from his original could be in jeopardy – sales @ retail stores, restaurants, & online sellers decreased in March from a revised decrease in February from January; the consumer price index declined in March; spending on vehicles & parts has fallen for three straight months; bank loan growth has slowed; & the budget deficit increased to $651 billion from $461 the past twelve months – see graphic below for current national debt time bomb. Now all of the above is certainly not Trump's fault but if the economy does not pick up he & the Republicans will get the blame. Losing the House &/or Senate majorities in 2018 will doom the remainder of Trump's presidency because the Democrats will just continue to oppose everything - but the difference from the present is that Trump will have no mechanism to move forward except by executive orders – we saw how that worked out the past two years. Another potential firecracker is the looming partial government shut down on or about April 28 when the government runs out of money for the umpteenth time. This time OMB Director Mick Mulvaney & Trump will need Democrat help to move funding bills out of the Senate – such bills to include a $30 billion increase in military spending, $2 billion to start the southern border wall project, & greater flexibility to deny funds to sanctuary cities – all points hated by Democrats. After seemingly accepting the failed attempt to repeal & replace ObamaCare three weeks ago Trump said he was moving on to his next priority of tax reform only to say last week "I'm going to get healthcare done" thereby in effect putting tax reform on hold while spending valuable time on the no-win healthcare political issue. In this regard Mulvaney told Laura Ingraham last Wednesday that a major repeal of ObamaCare – as opposed to the full repeal – would be completed in the House by April 29, the end date of Trump's first 100 days. No word on when the Senate would take this up, if it does move through the House. Mulvaney believes that getting rid of ObamaCare's most egregious parts will significantly improve the growth outlook – this is why they keep coming back to healthcare before tackling tax reform. But Trump needs economic growth like in the 1980s & 1990s – see above - to get the country totally behind him. Trump's refusal to release his income tax returns provides a Democrat excuse for not helping in tax reform or any other issue. We all know that releasing his income tax returns will merely cause the Dems to find fault or move on to another fake issue – so Trump doesn't do it. Republican plans for economic growth, as a matter of course, are based on lower corporate & individual income tax rates from which the circle is completed by Democrats bringing up tax cuts (not tax rates) for the wealthy that will produce more millionaires & billionaires @ the expense of the poor who pay no income taxes & have no jobs. It certainly is a tough row to hoe – but if anyone can pull a lot of it off it is Donald Trump - as he demonstrated last November. "I cannot undertake to lay my finger on that article of the Constitution which granted a right to Congress of expending, on objects of benevolence, the money of their constituents." - James Madison, Father of the Constitution, writing in 1794 regarding his intention that the federal government could only expend money for purposes specifically enumerated in the Constitution. It is neither the purpose nor a right of Congress to "attend to what generosity & humanity require, but to what the Constitution & their duty require." – Virginia Congressman William Branch Giles condemning a spending measure in 1796. Giles also served as VA governor & VA senator for 11 years. "I cannot find any authority in the Constitution for public charity." To approve the measure "would be contrary to the letter & the spirit of the Constitution & subversive to the whole theory upon which the Union of these States is founded." – President Franklin Pierce vetoing a popular measure in 1854. "I can find no warrant for such an appropriation in the Constitution, & I do not believe that the power & duty of the General Government ought to be extended to the relief of individual suffering which is in no manner properly related to the public service or benefit." President Grover Cleveland vetoing a bill for relief charity – one of many vetoes during his two terms in office regarding bills that violated the Spending Claus of the Constitution in his opinion. "Congress has not unlimited powers to provide for the general welfare, but only those specifically enumerated." - Thomas Jefferson's letter to Albert Gallatin, Secretary of the Treasury 1801 to 1814. "Ours is the job of interpreting the Constitution. And that document isn't some inkblot on which litigants may project their hopes & dreams for a new & perfected tort law, but a carefully drafted text judges are charged with applying according to its original meaning. If a party wishes to claim a constitutional right, it is incumbent on him to tell us where it lies, not assume or stipulate with the other side that it must be in there someplace." Neil Gorsuch, newest Associate Justice of the Supreme Court (to be sworn in on Monday) writing in a concurring opinion in a 2016 case. Today over half of the $4.147 trillion federal budget request for FY 2017 is spent on "objects of benevolence" – Social Security, Medicare, Medicaid, & over another 120 anti-poverty & welfare programs identified by the Cato Institute. This post focuses on the many misconceptions about Social Security including its unconstitutional origin, growth, & funding – it will show how our country went from the mindset intended by our Founders (& also expressed by our newest Supreme Court Justice) as stated above to one of government dependence that is ruining our heritage of liberty & prosperity. The above poster was presented by the federal government in the 1930s to entice people who had been in & out of work for five years or longer (due to intervention & interference by the federal government with the free enterprise system) to sign up for Social Security benefits. Everyone, whether employed or underemployed, who worked or had worked for salary or wages, except for agriculture, domestic service, or government work was eligible. Applications for Social Security accounts were available from employers or from the post office making it about as easy as it is today to register to vote @ the DMV. You could hand the completed application to your employer, labor union, or letter carrier – or deliver it to the local post office or mail it in a sealed envelop to the local Post Master with no postage required. The Social Security Act was signed into law by FDR on August 14, 1935. The Act followed the German old-age social insurance program designed in 1889 by German Chancellor Otto von Bismarck. Seemed like quite a good deal, actually New Deal, to receive a monthly check for life starting @ age 65 - except that life expectancy @ birth in 1930 was 58 for men & 62 for women so by this measure the program was a winner for government collecting taxes & not paying benefits. Even by the more appropriate measure, that stripped out the high infant mortality rate of 1930, life expectancy after attainment of adulthood statistics showed that 54% of men survived from 21 to 65 & 61% of women survived from 21 to 65 so even this measure gave the government assurance that the program was viable. They did not see what was coming. The original Social Security Act not only paid retirement benefits to the primary worker but included the first national unemployment compensation program, aid to states for various health & welfare programs, & the Aid to Dependent Children Program. By 1939 the law added Social Security survivor benefits & benefits for the retiree's spouse & children. In 1956 disability benefits were added. 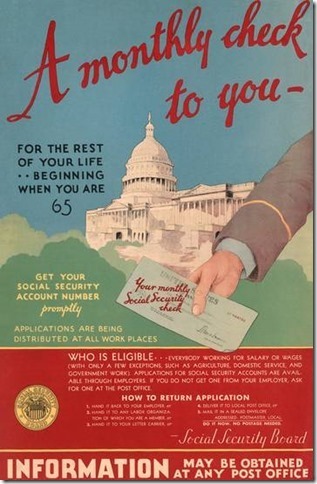 Payroll taxes for Social Security began in January 1937. From 1937 through 1939 lump sum payments were made to beneficiaries – the first such beneficiary was Ernest Ackerman who retired after paying one nickel into the system. Mr. Ackerman received a lump sum payment of 17 cents. Starting in January 1940 monthly payments began with Ida May Fuller being the first beneficiary. Ida May had paid $24.75 into the system over the three year interim & received $22.54 in her first monthly check – her lifetime total benefit was nearly $23,000. In 1940 there were 159.4 workers paying taxes into the Social Security system for every beneficiary collecting. Since 2009 the ratio has been less than 3 to 1. The Act lays two different types of taxes – an income tax on employees & an equal excise tax on employers, both measured by wages paid during the calendar year. The proceeds of both taxes are paid into the general treasury & are not earmarked in any way so that the current Social Security Trust Fund is merely an accounting of money taken from over payments to the Social Security system over the years that has to be repaid one day. With regard to the Social Security Trust Fund - the annual notice Social Security mails to people who have not set up a Social Security account warns prospective beneficiaries (from page two of sample statement on the Social Security website) – "Your estimated benefits are based on current law. Congress has made changes to the law in the past and can do so at any time. The law governing benefit amounts may change because, by 2034, the payroll taxes collected will be enough to pay only about 79 percent of scheduled benefits." 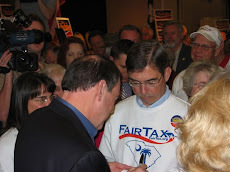 I have never met one person @ my FairTax seminars or anyone who has participated in radio programs I have been on that was aware of this warning. With regard to the excise tax that employers provide in matching the income taxes paid by employees (payroll taxes) concerning Social Security it is equally important to realize that this "matching share" is taken out of funds the employers dedicate to the total compensation of hiring the employee. As such the employer pays nothing – the worker is the source of the funds of both taxes. The employer's "matching share" is really part of the employee's total compensation that must be earned through the employee's productivity. If the employer doesn't receive value commensurate with the total compensation of the employee the job will be eliminated. I will always cherish the memory of the morning that Professor Williams returned my call to explain this point to me so that I would never forget it. The above "matching share" point is illustrated in the Supreme Court case of 1937, Helvering v. Davis in which George P. Davis was not prepared to pay the employer's share of Social Security tax arguing that this tax robbed him of part of his equity in the Edison Electric Illuminating Company. Davis lost the case & companies have paid the "matching share" out of employee's productivity since the start of the Social Security program – but the great majority of employees have always thought the employers paid this tax without ever wondering where the money came from. Once someone qualifies for Social Security retirement benefits under current rules the formula for determining the amount of retirement benefits @ full retirement age is based on a percentage of one's averaged indexed monthly earnings - 90% of the first $885, plus 32% of amounts over $885 to $5,336, plus 15% of amounts over $5,336. You can readily see that the benefit formula is designed to provide lower wage workers with a greater percentage of their past earnings than higher wage earners receive. The formula is steeply graduated in favor of lower wage workers so that they receive 90% of their retirement income while Social Security benefits fall off fast from that level for higher paid workers. At the beginning of 2016 the average monthly retirement benefit was $1,341 & the maximum retirement benefit was $2,639 for a worker who retired @ age 66 – both amounts are determined by the above formula. Do your own examples & arithmetic – for instance a worker who paid the maximum Social Security tax during his working life & retired @ age 66 in 2016 would have paid just under four times more into the system than a person who paid the average Social Security tax over his working life & also retired in 2016 @ age 66. The higher wage worker would receive only twice the benefit of the average wage worker after paying almost four times as much tax. The ratio is more pronounced when comparing the benefits & taxes paid of high earners to low earners. A review of the above formula shows that the way the Social Security Administration determines retirement benefits makes Social Security an income redistribution & welfare transfer system instead of a system where you receive benefits that pay your contributions back commensurate with what you put in over the years. So how is any of this constitutional? In 1937 FDR had the Congress under his thumb but not so much the Supreme Court. As such FDR threatened to have Congress enlarge the high court by six justices of which he would appoint liberal justices who would approve everything he proposed. The Supremes got the message & starting in March of 1937 began to find FDR's New Deal programs constitutional – shamelessly reversing decisions they had found unconstitutional just a short time before. So much for impartial court decisions & the rule of law. In finding the Social Security Act constitutional in May of 1937 the Supreme Court relied on Congress's taxing power to provide for the general Welfare of the United States – they found that Congress could authorize taxes to pay for a retirement/insurance program that had already expanded into many other areas as described above. This type of decision makes liberal justices like Ruth Bader Ginsburg think that the country was founded in 1937 instead of 1776. Founders such as Jefferson, Hamilton, Madison, & Monroe were specifically documented as regarding the words "general Welfare of the United States" as a limiting condition on government spending not one where anything goes to approve any government dependent welfare program. For instance, during his two terms in office President James Monroe (my favorite president) regularly vetoed spending bills because they did not provide for the entire nation's welfare – like defense spending would. In this same regard the Tenth Amendment Center explains that the words "United States" did not refer to a geographic territory or a single nation in the founding documents – the words referred to a compact or union between the several states so that the "general Welfare of the United States" dealt with this compact. Thus, the words "United States" specifically refers to the several states in their united or collective capacity (i.e., the States united). FDR, the Congress, & the Supreme Court all "used a provision of the Constitution that applied to the States, in their united capacity, & unconstitutionally applied it to the people"1 to tax & appropriate money for a welfare program that along with Medicare & Medicaid has become the cornerstone of the American welfare state – ObamaCare being the latest expansion thereof, derived into law by much the same type of terrible legal reasoning described hereinbefore. After the pathetic attempt to repeal ObamaCare ten days ago Trump needs a win in the worst kind of way. It is bad enough to wonder how Trump was mislead by Ryan to fall for the ObamaCare Lite healthcare reform approach (AHCA bill) that miserably failed to repeal or replace ObamaCare – but the one that worries me even more is the handful of no-name statist judges who blocked Trump's two temporary travel bans that sought to suspend the entry of all refugees to the United States for 120 days, anyone from Iran, Libya, Somalia, Sudan, Yemen, & originally Iraq, for 90 days as well as anyone from Syria indefinitely (later revised to 120 days) – these seven (now six with the revised second travel ban) countries were previously identified by BO as countries of concern to our safety & national security. Trump agreed that the travel ban did not apply to green card holders & people who had received valid State Department issued visas (i.e., these people had been vetted) – this is why a second travel ban was issued, the principles of which should be followed. The idea of the travel bans was to provide time for stronger vetting procedures to be put in place so that true refugees could be separated from terrorists – i.e., what Trump calls extreme vetting. People from the above six countries who had never set foot in America & had not previously been vetted were the ones affected by the second travel ban. The judges who have ruled against Trump on the two travel bans ruled that he likely engaged in religious discrimination in writing the travel ban executive orders (EOs) that temporarily barred people from six countries that are considered Muslim-majority nations. Instead of relying on the facts in front of them the judges cited Trump's statement during the political campaign, when he was a private citizen, that he wanted to ban Muslims from entering the U.S. & a TV appearance by Rudy Giuliani who has never been a member of the Trump administration. The judges were not concerned @ all about national security, safety, or terrorism. The WSJ editorial of March 17 says "That's a dubious – & dangerous – legal standard. By that reasoning, courts can reject any law not based on what it says but by parsing TV transcripts & divining the motives of public officials." As far as the claim that the travel bans target Muslims – 93% of the world's Muslims are not affected so this claim is another bogus argument. There also is the point that the case should not have been allowed by the courts because the states (Washington & Minnesota) that brought the suit do not have standing – i.e., to have standing a litigant (including states) must have an injury to a legally protected interest, caused by the challenged action, that can be remedied by a federal court acting within its constitutional power. Source David Rivkin & Lee Casey, constitutional & appellate attorneys who served in the White House Council's Office & the U.S. Justice Department during the Reagan & Bush 41 administrations. The win Trump is looking for should be forthcoming with the confirmation of Judge Neil Gorsuch to the Supreme Court. Actually Gorsuch's confirmation will be a double header win in that just having Gorsuch confirmed is a win in & of itself that will be refreshing & then Trump can appeal the lower court stays of the travel bans to the Supreme Court. Make no mistake about it - if Trump accepts the rulings of these mealy-mouthed judges who have ruled to date or a Supreme Court decision that plays games with national security it is a sign of weakness. The judiciary's performance in such a clear matter is a real shame that every American should be infuriated about – these judges just made-up whatever they wanted to stop Trump & this time they were not concerned @ all about the safety of our own citizens or the national security of our country. Without Gorsuch as the ninth Supreme Court Justice, Trump feared a biased court & four to four tie that would leave the lower court decisions in place. An impartial Supreme Court would reach a unanimous 9 to 0 decision when the appeal is filed but I will have to see it to believe it. Background - on Friday January 27 Trump issued the first EO @ the Pentagon entitled Protecting The Nation From Foreign Terrorist Entry Into The United States. This EO portrayed the travel bans as having such urgency that it was issued in the middle of the day with people actually on flights in the air who were affected resulting in airport turmoil & outrage over that weekend. Now, over two months later, the travel bans have not taken effect because of the judges' rulings & we don't know whether or not sleeper cell terrorists have entered the country during this period. The Constitution vests all executive power in the President. In the 1936 United States v. Curtiss-Wright case the Supreme Court wrote of "the very delicate, plenary & exclusive power of the President as the sole organ of the federal government in the field of international relations – a power which does not require as a basis for its exercise an act of Congress." In the 1950 Knauff v. Shaughnessy case the Supreme Court wrote that the President's authority to exclude aliens "stems not alone from the legislative power but is inherent in the executive power to control the foreign affairs of the nation" & in the 1952 Youngstown v. Sawyer case Justice Robert Jackson wrote "when the President acts pursuant to an express or implied authorization of Congress, his authority is @ its maximum, for it includes all that he possesses in his own right plus all that Congress can delegate." Section 212(f) of the Immigration & Nationality Act of 1952 (INA) states: "Whenever the President finds that the entry of any aliens or of any class of aliens into the United States would be detrimental to the interests of the United States, he may by proclamation, and for such period as he shall deem necessary, suspend the entry of all aliens or any class of aliens as immigrants or nonimmigrants, or impose on the entry of aliens any restrictions he may deem to be appropriate." This act is important because it shows one branch (Congress) of the federal government delegating power to another (the President). The above section of the INA has been relied on by presidents summarized as follows: 1) Carter in 1979 to bar anyone from Iran from entering the country until the hostage crisis was resolved, 2) Reagan in 1981 to bar any undocumented aliens "arriving @ the borders of the U.S. from the high seas", 3) Reagan in 1986 to bar Cuban nationals, with some exceptions, 4) Clinton in 1994 to bar anyone in the Haitian military or government affiliated with the 1991 coup d'état that overthrew the democratically elected president, 5) GW Bush in 2004 to bar corrupt members of the government of Zimbabwe from entering the U.S., 6) BO in 2011 to bar anyone from Iraq for six months, & 7) BO in 2012 to bar hackers aiding Iran & Syria. Sources Olivia B. Waxman writing for Time & Judge Napolitano. Based on the above it is obvious that Trump's EO temporarily banning entry to America of people from the specified countries who have no functioning governments that should be relied upon to vet travelers to America & are hot beds of terrorism is well within President Trump's constitutional authority, consistent with statutory law, & Supreme Court case law. In addition, the travel ban provides a vivid example of the importance of the Supreme Court in the lives of ordinary Americans. Just imagine if Hillary Clinton would have won the presidency & made the selection of the next Supreme Court justice – or worse yet the next several justices. The law of the land would change so that we would not recognize the rules & laws we live under. The importance of a Republican majority in the Senate is also revealed by this example. Fortunately, the Supreme Court is not the final word on such matters – "the power of the people is superior to both" the judicial & legislative powers. Source: The Federalist No. 78: Hamilton. Like the justices & members of Congress, Trump also takes an oath to preserve, protect, & defend the Constitution – but in his case Trump also swears to "faithfully execute the Office of President of the United States." To let the rulings of kangaroo-court-like justices stand that blatantly disregard the recognized standards of law & justice, especially when national security is involved is a violation of that oath. Trump either works to overturn the rulings through the judicial system as described above or ignores the rulings & proceeds with the travel bans & lets the people decide if his action is correct – much like Jefferson, Jackson, Lincoln, & FDR did in ignoring or criticizing the judiciary from time to time – source John Yoo & Sai Prakash, Law Professors @ Cal-Berkeley & Virginia respectively. Working through the judiciary system has the impracticality to our safety that over 60 days of jeopardy has already elapsed with incomplete vetting of foreign nationals who are possible terrorists. 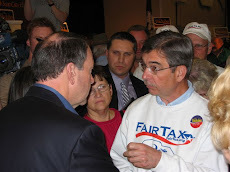 Now long time readers of this blog know the correct role of the Supreme Court - there were a series of posts in March 2012 during the oral arguments of the ObamaCare case & various posts from time to time where Mike Huckabee & Newt Gingrich explain the proper role of the judiciary. In this regard, click here to hear Robert George, Professor of Jurisprudence @ Princeton University, give a short tutorial that traces how the principles of the Founders, who thought of the judiciary as "the least dangerous (branch of government) to the political rights of the Constitution," has given way to the acceptance that the judiciary is the branch of government that can take away our liberties one after another – if we let them.